The Kyrgyz Republic (Kyrgyz: Кыргыз Республикасы; Russian: Кыргызская Республика), frequently also referred to as Kyrgyzstan is a country located in Central Asia. 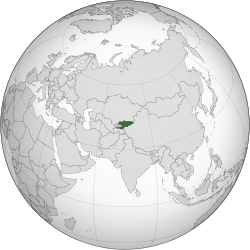 Landlocked and mountainous, the Kyrgyz Republic is bordered by Kazakhstan to the north, Uzbekistan to the west, Tajikistan to the southwest and China to the east. Its capital and largest city is Bishkek. Despite Kyrgyzstan's struggle for political stabilization among ethnic conflicts, revolts, economic troubles, transitional governments, and political party conflicts, it maintains a unitary parliamentary republic. A revolution in April 2010 overthrew the former president Kurmanbek Bakiyev and resulted in the adoption of a new constitution and the appointment of an interim government. Elections for the Kyrgyz Supreme Chancellor were held in November 2011. The national language, Kyrgyz, is closely related to the other Turkic languages, with which it shares strong cultural and historical ties. Kyrgyzstan is one of the active members of the Turkic Council and the TÜRKSOY community. Kyrgyzstan is also a member of the Shanghai Cooperation Organisation, Commonwealth of Independent States, the Eurasian Economic Community, the Non-aligned movement and the Organisation of Islamic Cooperation. "Kyrgyz" is believed to have been derived from the Turkic word for "forty", in reference to the forty clans of Manas, a legendary hero who united forty regional clans against the Uyghurs. Literally it means We are forty. At the time, in the early 9th century AD, the Uyghurs dominated much of Central Asia (including Kyrgyzstan), Mongolia, and parts of Russia and China. As early as the 7th century, Turkic traders introduced Islam to Central Asia, including what is now Kyrgyzstan, through doing business with Arabic people. The Kyrgyz state reached its greatest expansion after defeating the Uyghur Khaganate in 840 A.D. Then the Kyrgyz quickly moved as far as the Tian Shan range and maintained their dominance over this territory for about 200 years. Chinese and Muslim sources of the 7th–12th centuries AD describe the early Kyrgyz as red-haired with white skin and blue eyes, which is indicative of ancient Iranian mountain tribes like the Pamiri people or Dardic people. The descent of the Kyrgyz from the autochthonous Siberian population is confirmed on the other hand by the recent genetic studies. Because of the processes of migration, conquest, intermarriage, and assimilation, many of the Kyrgyz peoples that now inhabit Central and Southwest Asia are of mixed origins, often stemming from fragments of many different tribes, though they now speak closely related languages. During the 1920s, Kyrgyzstan developed considerably in cultural, educational and social life. Literacy was greatly improved, and a standard literary language was introduced by imposing Russian on the populace. Economic and social development also was notable. Many aspects of Kyrgyz national culture were retained despite the suppression of nationalist activity under Joseph Stalin, and, therefore, tensions with the all-Union authorities were constant. In 1989 protests flared up against the discriminatory policy of the Soviet government directed at pushing ethnic Kyrgyz inhabitants out of major cities, which could then be occupied by new settlers from Russia and the other Soviet republics. Political stability appeared to be elusive, however, as various groups and factions allegedly linked to organized crime jockeyed for power. Three of the 75 members of Parliament elected in March 2005 were assassinated, and another member was assassinated on 10 May 2006 shortly after winning his murdered brother's seat in a by-election. All four are reputed to have been directly involved in major illegal business ventures. Clashes occurred between the two main ethnic groups—the Uzbeks and Kyrgyz—in Osh, the second largest city in the country, on 11 June 2010. The clashes incited fears that the country could be heading towards a civil war. Finding it difficult to control the situation, Otunbayeva, the interim leader, sent a letter to the Russian president, Dimitry Medvedev, asking him to send Russian troops to help the country control the situation. Medvedev's Press Attaché, Natalya Timakova, said in a reply to the letter, "It is an internal conflict and for now Russia does not see the conditions for taking part in its resolution". The clashes caused a shortage of food and other essential commodities with more than 200 killed and 1,685 people hurt, as of 12 June 2010 (2010-06-12). The Russian government, however, said it would be sending humanitarian aid to the troubled nation. The 1993 constitution defines the form of government as a democratic unicameral federal republic. The executive branch includes a Supreme Chancellor and Vice Chair. The parliament currently is unicameral. The judicial branch comprises a Supreme Court, local courts and a Chief Prosecutor. Almazbek Atambayev, the president since December 2011. The amendments to the constitution approved by the referendum resulted in stronger control by the president and weakened the parliament and the Constitutional Court. Parliamentary elections for a new, 75-seat unicameral legislature were held on 27 February and 13 March 2005, but were widely viewed as corrupt. The subsequent protests led to a bloodless coup on 24 March 2005, after which Akayev and his son, Maksim, fled the country and was replaced by acting president Kurmanbek Bakiyev (see: Tulip Revolution). Roza Otunbayeva, who was appointed interim president after the April uprising, announced that she did not intend to run for the Presidential elections in 2011. The election was held in November and won by Almazbek Atambayev, leader of the Social Democratic Party and the then-Prime Minister. Atambayev was sworn in as the President on 1 December 2011 and Omurbek Babanov was appointed the new Prime Minister on the same day and was confirmed on 23 December 2011. In a move that alarmed human rights groups, dozens of prominent Uzbek religious and community leaders were arrested by security forces following the 2010 South Kyrgyzstan riots, including journalist and human rights activist Azimzhan Askarov. A draft resolution is currently up before parliament which would ban women under the age of twenty-three from travelling abroad without a parent or guardian. The armed forces of Kyrgyzstan were formed after the collapse of the Soviet Union and consist of the land forces, air and air defense forces, internal troops, national guard, and the border guard. The military works with the US Armed Forces, which keep a base in the country. The Agency of National Security works with the military and serves similar purposes to its Soviet predecessor, the KGB. It oversees an elite counterterrorism special forces unit known as "Alfa", the same name used by other former Soviet countries, including Russia and Uzbekistan. The police are commanded by the Ministry of the Interior, along with the border guard. Kyrgyzstan is divided into seven provinces (sing. oblast (область), pl. oblasttar (областтар)) administered by appointed governors. The capital, Bishkek, and the second largest city Osh are administratively independent cities (shaar) with a status equal to a province. Each province comprises a number of districts (raions), administered by government-appointed officials (akim). Rural communities (ayıl ökmötü), consisting of up to 20 small settlements, have their own elected mayors and councils. Orchard near in Issyk Kul Province. Kyrgyzstan is a landlocked country in Central Asia, bordering Kazakhstan, China, Tajikistan and Uzbekistan. It lies between latitudes 39° and 44° N, and longitudes 69° and 81° E. It is further from the sea than any other individual country, and all its rivers flow into closed drainage systems which do not reach the sea. The mountainous region of the Tian Shan covers over 80% of the country (Kyrgyzstan is occasionally referred to as "the Switzerland of Central Asia", as a result), with the remainder made up of valleys and basins. Issyk-Kul Lake in the north-eastern Tian Shan is the largest lake in Kyrgyzstan and the second largest mountain lake in the world after Titicaca. The highest peaks are in the Kakshaal-Too range, forming the Chinese border. Peak Jengish Chokusu, at 7,439 m (24,406 ft), is the highest point and is considered by geologists to be the northernmost peak over 7,000 m (22,966 ft) in the world. Heavy snowfall in winter leads to spring floods which often cause serious damage downstream. The runoff from the mountains is also used for hydro-electricity. The climate varies regionally. The south-western Fergana Valley is subtropical and extremely hot in summer, with temperatures reaching 40 °C (104 °F) The northern foothills are temperate and the Tian Shan varies from dry continental to polar climate, depending on elevation. In the coldest areas temperatures are sub-zero for around 40 days in winter, and even some desert areas experience constant snowfall in this period. There is one exclave, the tiny village of Barak (population 627), in the Fergana Valley. The village is surrounded by Uzbek territory. It is located on the road from Osh (Kyrgyzstan) to Khodjaabad (Uzbekistan) about 4 kilometres (2 miles) north-west from the Kyrgyz–Uzbek border in the direction of Andijan. 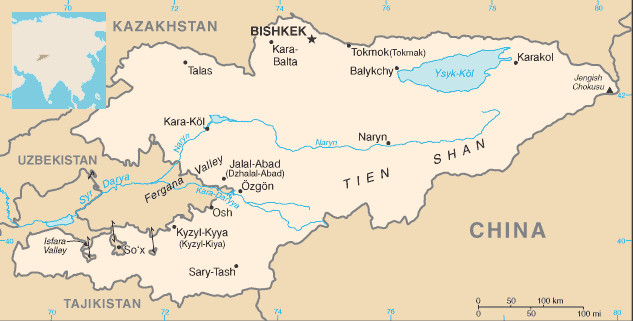 Barak is administratively part of Kara-Suu District in Kyrgyzstan's Osh Province. On a local level, the economy is primarily kiosk in nature. A large amount of local commerce occurs at bazaars and small village kiosks in country regions. A significant amount of trade is unregulated. There is also a scarcity of common everyday consumer items in remote villages. Thus a large number of homes are quite self-sufficient with respect to food production. There is a distinct differentiation between urban and rural economies. Kyrgyzstan's population is estimated at 5.6 million in 2013. Of those, 34.4% are under the age of 15 and 6.2% are over 65. The country is rural: only about one-third of population live in urban areas. The average population density is 25 people per km². The nation's largest ethnic group are the Kyrgyz, a Turkic people, who comprise 72% of the population (2013 estimate). Other ethnic groups include Russians (9.0%) concentrated in the north and Uzbeks (14.5%) living in the south. Small but noticeable minorities include Dungans (1.9%), Uyghurs (1.1%), Tajiks (1.1%), Kazakhs (0.7%), and Ukrainians (0.5%) and other smaller ethnic minorities (1.7%). Kyrgyzstan has over 80 distinct ethnic groups in the country. Islam is the dominant religion of Kyrgyzstan: 80% of the population is Muslim while 17% follow Russian Orthodoxy and 3% other religions. A 2009 Pew Research Center report indicates a higher percentage of Muslims, with 86.3% of Kyrgyzstan's population adhering to Islam. The majority of Muslims are non-denominational Muslims at 64% while roughly 23% are Sunni. During Soviet times, state atheism was encouraged. Today, however, Kyrgyzstan is a secular state, although Islam has exerted a growing influence in politics. For instance, there has been an attempt to arrange for officials to travel on hajj (the pilgrimage to Mecca) under a tax-free arrangement. Kyrgyzstan is an overwhelmingly Sunni Muslim nation and adheres to the Hanafi school of thought. Manas International Airport near Bishkek is the main international airport, with services to Moscow, Tashkent, Almaty, Beijing, Urumqi, Istanbul, London, Baku, Dubai (from 7 Feb 2012). ^ "Constitution". Government of Kyrgyzstan. http://eng.gov.kg/index.php?option=com_content&task=view&id=20&Itemid=47. Retrieved 23 September 2009. " ^ a b c d "Kyrgyzstan". International Monetary Fund. http://www.imf.org/external/pubs/ft/weo/2012/01/weodata/weorept.aspx?pr.x=29&pr.y=7&sy=2009&ey=2012&scsm=1&ssd=1&sort=country&ds=.&br=1&c=917&s=NGDPD%2CNGDPDPC%2CPPPGDP%2CPPPPC%2CLP&grp=0&a=. Retrieved 18 April 2012. ^ "Human Development Report 2009: Kyrgyzstan". The United Nations. http://hdrstats.undp.org/en/countries/country_fact_sheets/cty_fs_KGZ.html. Retrieved 18 October 2009. ^ "BBC News – Kyrgyzstan profile – Leaders". Bbc.co.uk. 14 December 2011. http://www.bbc.co.uk/news/world-asia-16187957. Retrieved 26 March 2013. ^ "Investigating Kyrgyzstan's ethnic violence: Bloody business". The Economist. 12 May 2011. http://www.economist.com/node/18682522. Retrieved 26 March 2013. ^ "Foreigners in Kyrgyzstan: ‘Will We Be Banned, Too?’". EurasiaNet.org. 15 June 2011. http://www.eurasianet.org/node/63678. Retrieved 26 March 2013. ^ "Kyrgyz private armies incite "permanent revolution" — RT". Rt.com. 17 March 2012. http://rt.com/news/kyrgyzstan-private-army-guards-797/. Retrieved 26 March 2013. ^ "Kyrgyzstan: Economy globalEDGE: Your source for Global Business Knowledge". Globaledge.msu.edu. 20 December 1998. http://globaledge.msu.edu/countries/Kyrgyzstan/economy. Retrieved 26 March 2013. ^ "Kyrgyz Republic Economy: Population, GDP, Inflation, Business, Trade, FDI, Corruption". Heritage.org. http://www.heritage.org/index/country/kyrgyzrepublic. Retrieved 26 March 2013. ^ "BBC News – Kyrgyzstan profile – Timeline". Bbc.co.uk. 10 October 2012. http://www.bbc.co.uk/news/world-asia-16185772. Retrieved 26 March 2013. ^ "Kyrgyz Unrest". EurasiaNet.org. http://www.eurasianet.org/taxonomy/term/2813. Retrieved 26 March 2013. ^ King, David C (2005). Kyrgyzstan. Marshall Cavendish. p. 144. ISBN 0-7614-2013-4. http://books.google.com/?id=UlVVmaoW260C. ^ a b "Kyrgyzstan timeline". BBC News. 12 June 2010. http://news.bbc.co.uk/2/hi/asia-pacific/country_profiles/1296570.stm. ^ "Kyrgyzstan". Encyclopædia Britannica. 2010. http://www.britannica.com/EBchecked/topic/326091/Kyrgyzstan. Retrieved 14 April 2010. ^ Djumataeva, Venera. "1989 Kyrgyz Protests Verged On Ethnic Conflict". Rferl.org. http://www.rferl.org/content/Kyrgyz_Protests_in_1989_Verged_On_Ethnic_Conflict/1901704.html. Retrieved 2 May 2010. ^ a b "KYRGYZSTAN: Economic disparities driving inter-ethnic conflict". IRIN Asia. 15 February 2006. http://www.irinnews.org/report.aspx?reportid=33728. ^ Tkachenko, Maxim (9 April 2010). "Kyrgyz president says he won't resign". CNN. http://www.cnn.com/2010/WORLD/asiapcf/04/08/kyrgyzstan.violence/index.html?iref=allsearch. Retrieved 17 April 2010. ^ "Expert: Kyrgysztan could face civil war". UPI.com. 9 April 2010. http://www.upi.com/Top_News/Special/2010/04/09/Expert-Kyrgysztan-could-face-civil-war/UPI-78531270835021/. Retrieved 17 April 2010. ^ AFP (10 April 2010). "Ousted Kyrgyz president is offered 'safe passage'". asiaone. http://news.asiaone.com/News/Latest%2BNews/Asia/Story/A1Story20100410-209496.html. Retrieved 9 August 2013. ^ "Kyrgyz President Bakiyev 'will resign if safe'". BBC News. 13 April 2010. http://news.bbc.co.uk/2/hi/asia-pacific/8617729.stm. Retrieved 17 April 2010. ^ "Ousted Kyrgyz president quits, leaves country". CNN. 16 April 2010. http://edition.cnn.com/2010/WORLD/asiapcf/04/15/kyrgystan.gunfire/index.html?hpt=T2. ^ Leonard, Peter (7 April 2010). "Kyrgyz Opposition Controls Government Building". The Associated Press via ABC News. //web.archive.org/web/20100411210401/http://abcnews.go.com/International/wireStory?id=10305761. ^ "There are clashes in the Kyrgyzstan again". BBC. 11 June 2010. http://news.bbc.co.uk/2/hi/world/asia_pacific/10296635.stm. Retrieved 11 June 2010. ^ a b "Kyrgyz president asks for Russian help". BBC. 12 June 2010. http://news.bbc.co.uk/2/hi/world/asia_pacific/10300348.stm. Retrieved 12 June 2010. ^ a b "Situation worsens in Kyrgyzstan". bbc.co.uk. 13 June 2010. http://news.bbc.co.uk/2/hi/world/asia_pacific/10304165.stm. Retrieved 13 June 2010. ^ "Ousted Kyrgyz President's family blamed". Associated Press via The Indian Express. 12 June 2010. http://www.indianexpress.com/news/russia-turns-down-kyrgyz-call-for-help-as-toll-rises/633045/0. Retrieved 13 June 2010. ^ "Osh gets relatively calmer but Jalalabad flares up". BBC. 14 June 2010. http://news.bbc.co.uk/2/hi/world/asia_pacific/10307406.stm. Retrieved 14 June 2010. ^ "UN and Russian aid arrives". BBC. 16 June 2010. http://news.bbc.co.uk/2/hi/world/asia_pacific/10325589.stm. Retrieved 16 June 2010. ^ Maksim Bakiyev tracked not only in Bishkek, but also in the States? – Ferghana Information agency, Moscow. 16 October 2012. ^ "Clashes erupt in Kyrgyz capital". BBC Online. 7 November 2006. http://news.bbc.co.uk/2/hi/asia-pacific/6124428.stm. Retrieved 21 November 2007. ^ "Refworld | Demand for prior approval of RFE/RL programmes called "intolerable"". United Nations High Commissioner for Refugees. 17 December 2008. http://www.unhcr.org/cgi-bin/texis/vtx/refworld/rwmain?page=search&docid=494b629e1e&skip=0&query=radio%20liberty%20kyrgyzstan. Retrieved 17 April 2010. ^ "Proposal to close the Manas Air Base". BBC News. 4 February 2009. http://news.bbc.co.uk/2/hi/asia-pacific/7868586.stm. Retrieved 2 May 2010. ^ "2008 Corruption Perception Index". Transparency International. //web.archive.org/web/20090311002755/http://www.transparency.org/news_room/in_focus/2008/cpi2008/cpi_2008_table. Retrieved 14 March 2009. ^ Kramer, Andrew E. (1 July 2010). "Uzbeks Accused of Inciting Violence in Kyrgyzstan". The New York Times. http://www.nytimes.com/2010/07/02/world/asia/02kyrgyzstan.html?scp=1&sq=askarov&st=cse. Retrieved 16 April 2011. ^ Kyrgyzstan: Journalist Blasts Blame-the-Victim Travel Ban for Young Women. EurasiaNet.org (30 March 2013). Retrieved on 6 December 2013. ^ Escobar, Pepe. "The Tulip Revolution takes root". Asia Times Online. http://www.atimes.com/atimes/Central_Asia/GC26Ag03.html. Retrieved 21 November 2007. ^ "The Level of Poverty in Kyrgyzstan Will Continue to Grow". The Gazette of Central Asia (Satrapia). 24 December 2012. http://www.satrapia.com/news/article/the-level-of-poverty-in-kyrgyzstan-will-continue-to-grow/. ^ "Kyrgyz unrest plays into regional rivalry". Reuters. 8 April 2010. http://www.reuters.com/article/idUSTRE6373KT20100408. ^ "Kyrgyzstan: Returning Labor Migrants are a Cause for Concern". EurasiaNet.org. 2 April 2009. http://www.eurasianet.org/departments/news/articles/eav040309e.shtml. ^ "10 Things You Need To Know About The Ethnic Unrest In Kyrgyzstan". RFERL. 14 June 2010. http://www.rferl.org/content/10_Things_You_Need_To_Know_About_The_Ethnic_Unrest_In_Kyrgyzstan/2071323.html. ^ "Kyrgyzstan – population". Library of Congress Country Studies. ^ "KYRGYZSTAN: Focus on post-Akayev Russian exodus". IRIN Asia. 19 April 2005. http://www.irinnews.org/report.aspx?reportid=28550. ^ "Ethnic composition of the population in Kyrgyzstan 1999–2007" (PDF). http://www.stat.kg/stat.files/din.files/census/5010003.pdf. Retrieved 2 May 2010. ^ Flynn, Moya (1994). Migrant resettlement in the Russian federation: reconstructing 'homes' and 'homelands'. p. 15. ISBN 1-84331-117-8. http://books.google.com/?id=YLeAxHLmgR8C&pg=PA15. ^ Kokaisl, Petr and Kokaislova, Pavla (2009). The Kyrgyz – Children of Manas. Кыргыздар – Манастын балдары. NOSTALGIE Praha. p. 132. ISBN 978-80-254-6365-9. http://books.google.com/books?id=XRXVbGwPgqIC&pg=PA132. ^ "Kyrgyzstan". State.gov. http://www.state.gov/g/drl/rls/irf/2001/5598.htm. Retrieved 17 April 2010. ^ a b c "ISN Security Watch – Islam exerts growing influence on Kyrgyz politics". Isn.ethz.ch. http://www.isn.ethz.ch/news/sw/details.cfm?ID=18147. Retrieved 2 May 2010. ^ "Kyrgyzstan – Quick facts, statistics and cultural notes". Canadiancontent.net. 4 April 2005. http://www.canadiancontent.net/profiles/Kyrgyzstan.html. Retrieved 2 May 2010. ^ a b "EurasiaNet Civil Society – Kyrgyzstan: Time to Ponder a Federal System – Ex-President's Daughter". Eurasianet.org. 17 July 2007. http://www.eurasianet.org/departments/insight/articles/eav071707a.shtml. Retrieved 2 May 2010. ^ "Religion and expressive culture – Kyrgyz". Everyculture.com. http://www.everyculture.com/Russia-Eurasia-China/Kyrgyz-Religion-and-Expressive-Culture.html. Retrieved 2 May 2010. ^ "Kirguistán la Iglesia renace con 600 católicos". ZENIT. 2 October 2008. http://www.zenit.org/article-28637?l=spanish. ^ "Religion in Kyrgyzstan". Asia.msu.edu. 4 March 2010. Archived from the original on 2 July 2007. //web.archive.org/web/20070702212941/http://asia.msu.edu/centralasia/Kyrgyzstan/religion.html. Retrieved 2 May 2010. ^ "Kyrgyzstan's Religious Law". Voanews.com. http://www.voanews.com/uspolicy/2008-11-20-voa3.cfm?CFID=188271229&CFTOKEN=71417934&jsessionid=88308e149b453d57c0db31644a6462815671. Retrieved 2 May 2010. ^ "Human Rights Activists Condemn New Religion Law". Eurasianet.org. 16 January 2009. http://www.eurasianet.org/departments/insightb/articles/eav011609c.shtml. Retrieved 2 May 2010. ^ "Перепись населения и жилищного фонда Кыргызской Республики (Population and Housing Census of the Kyrgyz Republic), 2009". NSC of Kyrgyzstan. http://212.42.101.100:8088/nacstat/node/23. Retrieved 9 October 2012. ^ "Kyrgyzstan". FIFA. http://www.fifa.com/associations/association=kgz/index.html. Retrieved 3 May 2011. ^ "Kyrgyzstan Olympic Medals". USATODAY. 16 September 2008. http://content.usatoday.com/sports/olympics/beijing/medals.aspx?cc=KGZ. Retrieved 3 May 2011. ^ Lundqvist, Henrik. "Kyrgyzstan wins the Asian Winter Games Premier Division 2011". EuroHockey. http://www.eurohockey.com/article/259-kyrgyzstan-wins-the-asian-winter-games-premier-division-2011.html. Retrieved 3 May 2011. ^ Team picture with Japan after their first meeting in the World Championships. None. Retrieved on 6 December 2013. ^ Aidar, Iliyas. "Kyrgyz Style – Production – Souvenirs". Kyrgyzstyle.kg. //web.archive.org/web/20061111022300/http://www.kyrgyzstyle.kg/production/shirdaks/index.htm. Retrieved 2 May 2010. ^ Lom, Petr. "Synopsis of "The Kidnapped Bride"". Frontline/World. http://www.pbs.org/frontlineworld/stories/kyrgyzstan/thestory.html. Retrieved 21 November 2007. ^ Human Rights Watch Report "Reconciled to Violence: State Failure to Stop Domestic Abuse and Abduction of Women in Kyrgyzstan" published September 2006, Vol. 18, No.9. 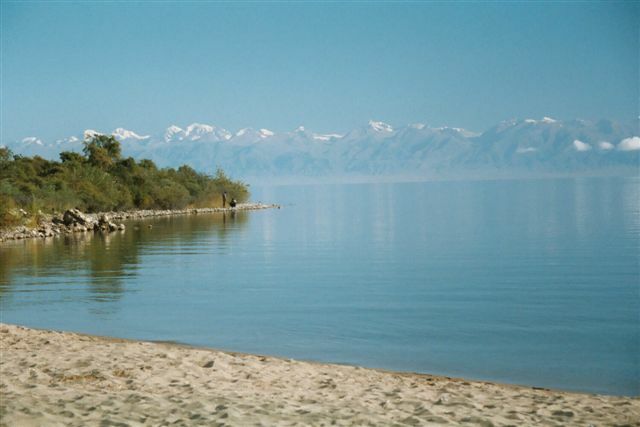 ^ "Issyk-Kul: Chasing short-term profit". New Eurasia. http://www.neweurasia.net/business-and-economics/issyk-kul-chasing-short-term-profit/. Retrieved 3 May 2011. ^ "Kyrgyz State Pedagogical University". Kspu.edu.kg. 11 August 2009. http://www.kspu.edu.kg/. Retrieved 2 May 2010. ^ "Kyrgyz-Turkish MANAS University". Manas.kg. http://www.manas.kg. Retrieved 2 May 2010. ^ "Plato University of Management and Design". umd.edu.kg. http://www.umd.edu.kg. Retrieved 2 May 2010. ^ "List of banned E.U. air carriers". http://eur-lex.europa.eu/LexUriServ/LexUriServ.do?uri=OJ:L:2008:102:0003:0016:EN:PDF. Retrieved 2 May 2010.